The audio presentation in the galleries is delivered by Sennheiser’s guidePORT wireless information system. As visitors walk past each exhibit, they hear the audio live in real time from the video they’re seeing. At last, they have it: the Musical Instrument Museum, a $250 million project founded by former Target CEO Bob Ulrich, held its grand opening April 24. Housing more than 12,000 instruments from every country in the world; five galleries focusing on different regions of the world, plus an Artist Gallery and Experience Gallery; a 299-seat performance theater and recording studio; and stateof- the-art technology throughout, the Musical Instrument Museum delivers a superior—maybe transcendent— aural and visual experience. In the spirit of music’s omnipresence, the museum, designed by RSP Architects, takes a comprehensive approach to both instruments and musical genre and tradition, spanning kings to commoners. 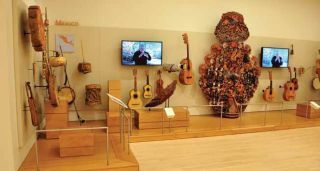 Systems integration for the 190,000-square-foot, two-story Musical Instrument Museum was handled by the Tempe, AZ office of Escondido, CA-based Sound Image. Sales engineer Ryan Baumann was key to the multifaceted project’s design and installation, working with two AV consultants. “There’s the main building and the theater,” Baumann explained. “The main building consultant was Shen Milsom & Wilke, who did a lot of technology design for the building—not just audiovisual but also security and low-voltage cabling and data cable. “The plans for their structured cable and security were kept mostly intact,” he added, and as the project progressed, the owner hired Sound Image for design/build on the audiovisual portion of the project. “So for the most part, the main building systems were designed internally by Sound Image,” Baumann said. The MIM Music Theater’s PA consists of Meyer Sound CQ-2 loudspeakers for main left and right; five Meyer MM-4XP self-powered miniature speakers; a third CQ-2 for cinema center speaker; two Meyer USW-1P subwoofers; and six Meyer UPJuniors for stage monitors. A secondary, removable speaker system, says Baumann, will be added in the coming months. Sound reinforcement gear also includes two BSS Audio BLU-160 signal processors, a Wohler AMP1A rackmounted monitor, an HHB CDR882 dual-drive CD recorder and Klein + Hummel O 110 monitors. Video equipment includes three Sony BRCH700 HD video cameras, a Panasonic AV-HS450 production switcher, two MAXX 2400 HD video servers from 360 Systems, and Crestron Digital Media video switching to a Panasonic PT-DZ12000U projector. The MIM Music Theater’s PA consists of Meyer Sound CQ-2 loudspeakers for main left and right; five Meyer MM-4XP selfpowered miniature speakers; a third CQ-2 for cinema center speaker; two Meyer USW- 1P subwoofers; and six Meyer UPJuniors for stage monitors. MIM will collect and display musical instruments from every country in the world, preserving, protecting, and sharing these gifts with future generations. Live performances by internationally renowned artists in MIM’s theater will give guests an opportunity to hear the music from every corner of the globe in an intimate, comfortable environment with superb acoustics. Christopher Walsh (chrisink@live.com) is a New York-based journalist, musician, and recording engineer. He has covered music and professional audio for publications including Billboard, Pro Sound News, and Pro Audio Review for 13 years.